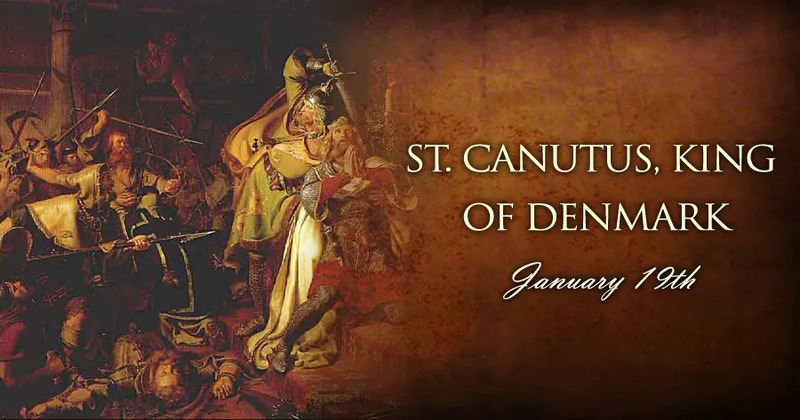 Saint Canutus, King of Denmark, succeeded his elder brother Harold on the throne of Denmark in the year 1080. He began his reign by a successful war against the enemies of the state, and by planting the faith in the conquered provinces. Amid the glory of his victories he humbly prostrated himself at the foot of the crucifix, laying there his diadem, and offering himself and his kingdom to the King of kings. After having provided for the peace and safety of his country, he married Eltha, daughter of Robert, Earl of Flanders, who proved herself a spouse worthy of him. The justice of Saint Canutus as sovereign was well known. He applied himself to the reform of all internal abuses. For this purpose he enacted severe but necessary laws for the strict administration of justice, the repression of violence and tyranny by the powerful, without respect to persons. He favored and honored holy men, and granted many privileges and immunities to the clergy. His charity and tenderness towards his subjects made him study all possible ways to make them a happy people. During a rebellion in his kingdom, the king was surprised at church by the rebels. He confessed his sins and received Holy Communion. Stretching out his arms before the altar, he was struck down on his knees by the enemies of his Christian reign.